Welcome to edition 252 of Insider Weekends. Insider buying decreased last week with insiders buying $33.56 million of stock compared to $36.59 million in the week prior. Selling also declined with insiders selling $883.34 million of stock last week compared to $1.08 billion in the week prior. Sell/Buy Ratio: The insider Sell/Buy ratio is calculated by dividing the total insider sales in a given week by total insider purchases that week. The adjusted ratio for last week dropped to 26.32. In other words, insiders sold more than 26 times as much stock as they purchased. 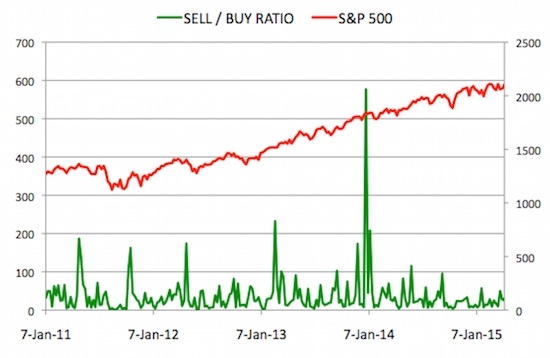 The Sell/Buy ratio this week compares favorably with the prior week, when the ratio stood at 29.39. We are calculating an adjusted ratio by removing transactions by funds and companies and trying as best as possible only to retain information about insiders and 10% owners who are not funds or companies. Director Mallika Srinivasan acquired 90,332 shares of this farm & construction machinery company, paying $47.58 per share for a total amount of $4.29 million. These shares were purchased indirectly by Chennai, India based TAFE Motors and Tractors Limited. You can view the list of recent insider transactions for AGCO Corporation here. Executive Chairman of the Board John B. Walker acquired 300,000 shares of this oil & natural gas exploration and production company, paying $14.25 per share for a total amount of $4.28 million. Mr. Walker increased his stake by 16.10% to 2,163,698 shares with this purchase. These shares were acquired indirectly by John B. and Lisa A. Walker, L.P.
You can view the list of recent insider transactions for EV Energy Partners LP here. Chairman and CEO Sardar Biglari, acquired 10,311 shares of this restaurant holding company, paying $413.67 per share for a total amount of $4.27 million. These shares were purchased indirectly by The Lion Fund. You can view the list of recent insider transactions for Biglari Holdings Inc. here. Director Gordon Crawford acquired 35,000 shares of this movie production and distribution company, paying $31.23 per share for a total amount of $1.09 million. Mr. Crawford increased his stake by 16.93% to 241,790 shares with this purchase. This was an interesting purchase for multiple reasons. I have written about Lions Gate and have invested in the company in the past when it was trading in the high single digits. Unfortunately I did not hold it long enough to realize a nearly 5 fold increase in the stock that Carl Icahn’s ex-protege Mark Rachesky realized from his purchases back in 2011. Mr. Rachesky has started taking some profits off the table with a 10 million share sale this week generating $316 million from the sale. Even as Mr. Rachesky is selling stock, veteran media investor Gordon Crawford is increasing his stake in Lions Gate. Mr. Crawford joined the board of Lionsgate in February 2013. He retired after nearly four decades with the asset management firm Capital Group that manages approximately $1 trillion in assets. The LA Times wrote an interesting article about him around the time of his retirement in December 2012 that is well worth a read. You can view the list of recent insider transactions for Lions Gate Entertainment Corp. here. Chief Financial Officer Patrice de Talhouet acquired 17,569 shares of this cosmetics company, paying $24.86 per share for a total amount of $436,765. Mr. Talhouet increased his stake by 9.26% to 207,297 shares with this purchase. You can view the list of recent insider transactions for Coty Inc. here. You can view the full list of purchases from this Insider Buying page. Director Evan Clark Williams sold 468,000 shares for $51.41, generating $24.06 million from the sale. These shares were sold through various trusts. Vice President of Product Kevin Weil sold 5,299 shares for $51.26, generating $271,636 from the sale. Voluntary Disclosure: I hold a long position in Twitter. You can view the list of recent insider transactions for Twitter, Inc. here. Chief Product Officer Frederic B. Luddy sold 203,600 shares for $78.42, generating $15.97 million from the sale. Chief Financial Officer Michael Scarpelli sold 40,000 shares for $81.91, generating $3.28 million from the sale. These shares were sold as a result of exercising options immediately prior to the sale. You can view the list of recent insider transactions for ServiceNow, Inc. here. Executive VP & Controller Richard Levy sold 95,000 shares for $54.48, generating $5.18 million from the sale. These shares were sold indirectly through a trust. Senior Exec. Vice President David M. Carroll sold 77,000 shares for $54.81, generating $4.22 million from the sale. These shares were sold indirectly through a trust. Sr. Executive Vice President James M. Strother sold 50,000 shares for $54.80, generating $2.74 million from the sale. You can view the list of recent insider transactions for Wells Fargo & Company here. Chairman, CEO & President Charif Souki sold 50,000 shares for $77.97, generating $3.89 million from the sale. Executive VP – Asset Group Keith R. Teague sold 25,000 shares for $77.87, generating $1.95 million from the sale. Sr. VP and General Counsel Greg W. Rayford sold 12,000 shares for $77.89, generating $934,639 from the sale. You can view the list of recent insider transactions for Cheniere Energy, Inc. here. Chairman James C. Koch sold 15,000 shares for $264.99, generating $3.97 million from the sale. V.P. of Human Resources Ai-li Lim sold 1,333 shares for $269.08, generating $358,680 from the sale. These shares were sold as a result of exercising options immediately prior to the sale. V.P. of Brand Development Robert P. Pagano sold 1,000 shares for $270.00, generating $270,000 from the sale. These shares were sold as a result of exercising options immediately prior to the sale. You can view the list of recent insider transactions for Boston Beer Co. Inc. here. You can view the full list of sales from this Insider Sales page.